Remember the Greek chorus in Mighty Aphrodite? Well, Woody Allen seems to have decided that absurdist touches like that are exactly what his movies need nowadays. So in his new movie, Everyone Says I Love You, he delivers a musical. It's not a full-blooded, 100% musical like Hollywood used to make. Allen plays the musical scenes as camp. The actors sing timidly in a hesitant, I-can't-believe-we're-really-doing-a-musical fashion. Occasionally, the musical numbers spring to life when Allen really lets them get loony, as when a hospital breaks out in song and dance: even a guy in a straight jacket, a group of pregnant women, and some corpses join in. The rest of movie, however, plays out as rather conventional Allen material, the kind of upper-crust New York humor (boy, does he ever love rich people) that he almost exclusively does anymore. Everyone Says I Love You is pleasant enough, but the musical numbers are just the icing on the cake, while the rest of the movie is typical Allen material. It's a good time, with several funny scenes, but I can't help but feel Allen is on cruise control, that all he can really get excited about anymore are fellow New Yorkers. 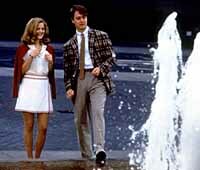 Alan Alda and Goldie Hawn play an uppercrust couple whose daughter, Drew Barrymore, is engaged to Edward Norton. But he's a bit dull, so she falls for an ex-con, played by Tim Roth, who can't wait to put the mash on her. Lukas Haas is also on hand as Alda's son; Haas (a conservative) and Alda (a liberal) constantly bicker about politics. And Natalie Portman takes a supporting role as another daughter. Woody plays Goldie's ex-husband. He now vacations in Paris, where he meets Julia Roberts. With the help of his daughter, and the inside information she provides (it seems she listened in on the counseling sessions between her mother, a psychologist, and Roberts), Woody plans to woo Roberts. Woody paints New York in glorious colors, as if it's the most beautiful city in the world. In fact, the "You" in the movie's title, may very well be New York. No city has ever glowed as heavenly as New York does in Everyone Says I Love You. The WASPs have overtaken it and claimed it as their own. The movie plays out as a big-screen fantasy of life in New York, as gloriously romantic and optimistic as any full-blooded Hollywood musical could have offered. We even get Hawn and Allen performing a magnificent dance that defies the law of gravity down on the riverfront. As much as I enjoyed the movie, and it is indeed fun, it all seems quite familiar fare for Allen, the musical numbers notwithstanding. The jokes are funny and the movie looks marvelous, but it also seems slight, as if we're watching Woody in a decidedly minor mood. Not the kind of lighter moment that many of his old fans still hope for, where he delivers a genuinely whacked out comedy like Sleeper or Bananas, but the kind of minor mood where an artist might retreat when he feels the need to produce a light little truffle and not be troubled with producing something "important." On those terms, Everyone Says I Love You shows Allen clearly enjoying moviemaking. But the movie is also, unfortunately, an artistic dead end.